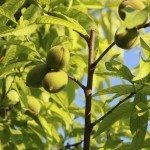 I live in South Carolina and have just planted a peach tree. I have staked it to straighten and support. It looks to be too tall and more grows on one side than the other. When should I trim this. . . wait until spring or now in the fall? Also, which branches do I cut? The best time of year to prune is in February, once the danger of frost has passed but before any fruit has begun budding/blooming. First, cut off any dead or damaged limbs. Next, remove any branches growing towards the center of the tree as well as any downward-facing shoots. Also remove any small, thin shoots. Once blooming has begun, it may also help to pinch off some of the buds to induce more productive fruit.